Acorn Edition Prosciutto for sale. Buy online at Zingerman's Mail Order. Gourmet Gifts. Food Gifts. The pinnacle of American pork. 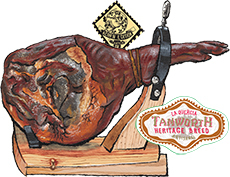 La Quercia’s Acorn Edition Tamworth hams is made to the highest standards for any ham I've ever had. These unsmoked hams, aged for an exceptional two years, are from red-haired Tamworth hogs who lived the last four months of their lives feasting on nuts, just as the famed Ibérico hogs do in Spain. While Ibérico hogs eat acorns in the Dehesa of central and southern Spain, these Tamorths eat acorns and hickory nuts in Missouri. Famed hog farmer Russ Kremer's 120-acre oak and hickory hillside in the Ozarks hosts a herd of the hogs. When the nuts start falling in August, Russ moves the heritage breed beauties into the woods for four months of happy feasting. Up to 75% of their diet during that time consisted of acorns and hickory nuts. The effect of a nut-heavy diet on ham’s fat is magical. It softens it, lowering its melting point to near body temperature so that when you bite into a piece it practically melts on your tongue. This is an exceptional eating experience. If you’re looking for something special, there isn’t anything quite like it. Only a handful of these hams are available in the country each year— we have two. Like with all La Quercia cured meats, the pigs receive no hormones and no sub-therapeutic antibiotics. The pigs are far from being confined; they have access to the out-of-doors and room to root and roam. Need a ham stand? Get one here. Whole hams last for many months. Ships at ambient temperature, store below 70 degrees, ideally between 40 and 60 degrees. Download our Ham Storage & Slicing instructions.